The enormous tops of these hose were designed to fit inside the bucket- shaped Cavalier boots worn during the time of Charles I (reigned 1625-1649). These fashionably wide boots were worn with the tops turned down almost to the ankle. 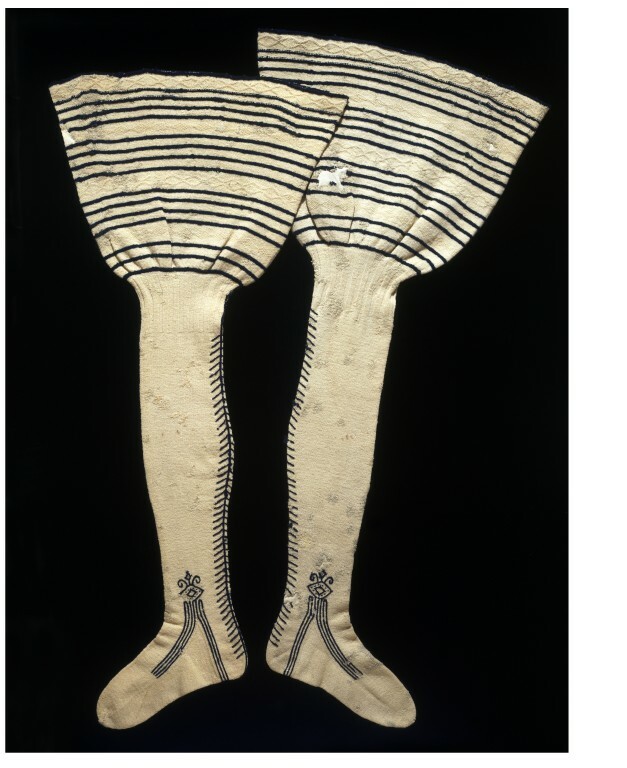 The shape and decoration of these knitted hose imitates that of the cut cloth hose which gentlemen wore at this time. 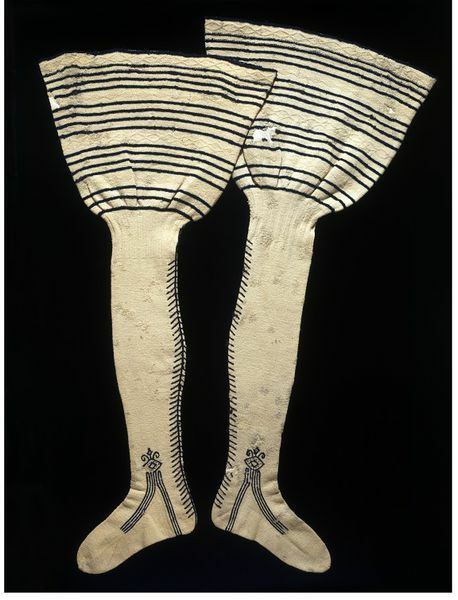 For example, the back of the leg and the clock decorating the ankle are embroidered in blue wool. Once introduced, people preferred woollen hose, which were better fitting and more comfortable. These hose were knitted in stocking stitch in the round with fine two-ply wool. To make each one, the knitter cast on approximately 375 stitches. These were only slightly reduced, by decreasing down the imitation back seam, before they were gathered by knitting two together into the last blue stripe. The knitter controlled the remaining 140 stitches by a band of ribbing before continuing the legs in stocking stitch. The legs were shaped by two lines of decreasing, eight stitches in, on either side of the imitation seam. The heels were turned by a variation of the 'Dutch' heel, with gussets. Three lines of decreasing were used to round the toes. Boot hose knitted with 2-ply wool in stocking stitch. The wide tops are striped blue on a white ground. 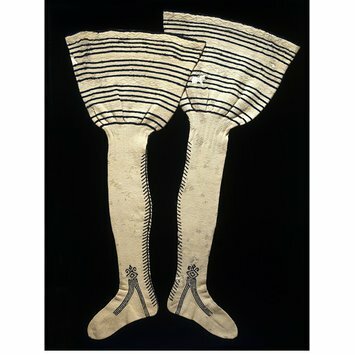 Boot hose of knitted wool, English, 1640s. Levey, Santina M. Illustrations of the History of Knitting Selected from the Collection of the Victoria and Albert Museum. Textile History Volume 1, Number 2, December 1969. Plate V.